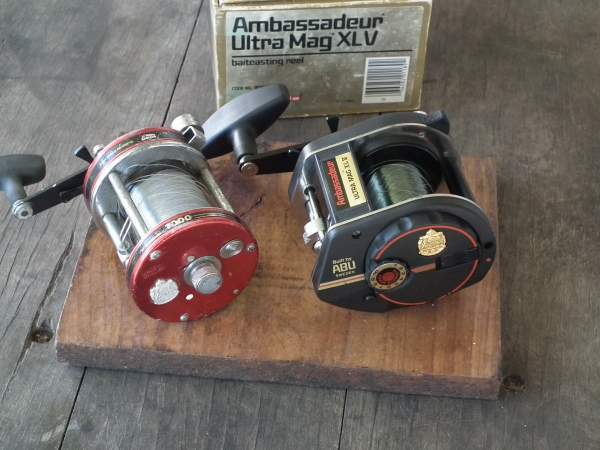 This is a mid-80's(?, serial #850400) Abu Garcia Ambassadeur Ultra Mag XL V(5). Probably bout a 3/0 size baitcast style inshore reel. I assume XL means: extra large, relative to the 6 or so models in the series that came before it. This one and the VI(6) are hard to find and probably didn't sell well. Edit:Can't seem to post the rest of the story(levelwind stuff) for unknowen reasons, try latter, with" post reply". Thanks Chad. Can't seem to post "The Rest of The Story" , i.e., details about the levelwind function, including pictures. Workin on it... Seems it's the post won't work when I'm tryin to add pictures. Anyway, when you engage freespool, the pawl cover(black graphite part) rolls off(disengages) the levelwinding device. Cool looking reel! I'm intrigued! The levelwinder is actually 2 units, held together by a magnet. When ready to cast you can push each one to it's respective side for relatively friction-free casting. So now the freespool button is pushed in, the levelwind is disengaged and I started to push the levelwind wires apart. Oh, oh, oh! It's workin! I'm able to post. Also, the seperated levelwind units can be pushed over into grooves on either side a the frame, for simi-permanent no-levelwind use. If the levelwind wires are separated, but not down in the grooves, when you reel in, it automatically goes back into gear and the pawl mechanism also rolls back into gear, moves along as you crank, and collects each levelwind 1/2unit, snapping them back together via the magnet. Coolest, most versitile level winder I've ever seen. Even though I've nearly worn out the reel, it's never failed. There were other Abu’s that had the same type levelwind system. They were a smaller reel. I think i have one in the shop. 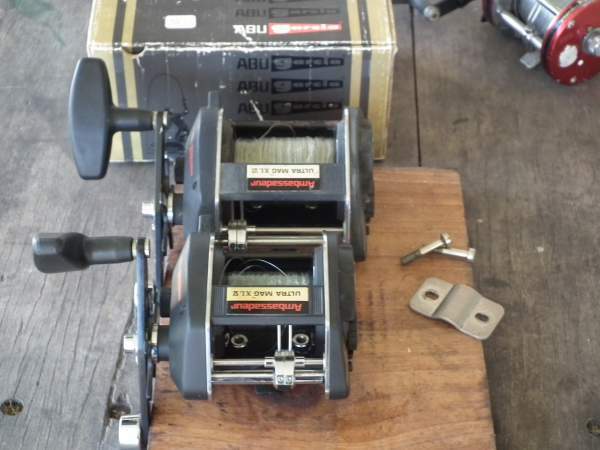 This is a mid-80's(?, serial #850400) Abu Garcia Ambassadeur Ultra Mag XL V(5). Probably bout a 3/0 size baitcast style inshore reel. I assume XL means: extra large, relative to the 6 or so models in the series that came before it. Nice reel Gfish, looks like it's served you well. They are fairly large for a 'low profile' reel. ABU claim line capacity of 20 lb/500yds and 30 Lb/300 yds. If it's yours and you wanna sell it lemme know. Bout a day ago I gave up on onea those _bay bidding wars, with those stupid 0.50 cent increases, no matter what I bid. That line volume sounds excessive, but may well be true. Man! Didn't know there's that many models made! for the 1st pics and considering its an Abu garcia, I would have never though how big it was when compared to a 7000 size ambassadeur. what kind of fish have you caught with yours in your waters?